Manon � Suis-je gentile ainsi? Gabrielle Ritter-Ciampi shared something with tenor Miguel Villabella, whose Malibran disc I�ve also reviewed; near contemporaries they both had very fine musical fathers and their careers, which began in the same year, 1917, followed the same rather local trajectory. Esteemed within France neither travelled far beyond it and theirs remained, in the main, local talents. Local however doesn�t necessarily mean inferior or parochial as the cases of these two singers quite adequately demonstrates. Her father was the Italian Ezio Ciampi, a tenor who had toured with Piatti and set up a teaching studio in Paris. Her uncle was pianist Theodore Ritter and initially she trained as a pianist � it wasn�t until she was sixteen that she retrained as a singer. Her first engagement was at the Trianon-Lyrique in 1917 as Violetta but two years later she was, just ahead of Villabella, at the Opéra-Comique in Mozart. Her Countess in the Marriage of Figaro was held in the greatest esteem and her career developed its own natural momentum � she sang more Mozart under Messager and Hahn (her Don was usually Renaud) and in some of her few visits outside France (for example at the 1932 Salzburg Festival) it was Mozart she sang. She sang Louise, Marguerite, Manon, the Marschallin, sang in Rameau as well as Rosina, Gilda and Violetta. Like Villabella she also espoused Aria Antiche � though she never recorded any � and as with him her career wound down after the end of the Second War, though she did give the premiere of Dona Irene in Hahn�s Oui de jeunes filles in 1949. She died in 1974. The vast majority of her recordings were made for Pathé and we get a selection made between 1923 and 1929. She was a light lyric soprano with a fine though not transcendental technique though one that sported great flexibility. We can hear the solidity of that technique in the opening Donizetti and Meyerbeer; in the latter�s O beau pays she shows off her upper register to good effect as she does her quick tight trills. There�s no great power in the voice as such - despite the technical achievement she doesn�t project dominatingly � but it�s light and even and a splendid instrument in the chosen repertoire. She�s hampered by the oom-pah accompaniment in Le Pardon de Ploermel but there�s great fluidity and nobility in her Mignon � though she�s not always quite accurate in her runs. Poised and sustained she excelled in showpiece arias - some may well tax your musical patience here � but her coquettish trills and accurate intervals (not always but often) are a pleasure to hear. She was a stylish light French soprano whose daring embraced Rode�s Variations, stupefyingly crass as music but eventful to hear in vocal guise, not least from her. Even she is taxed by some of the demands of Massé�s Le Carnaval de Venise � this is an outrageous Paris Conservatory-type test piece and reminds me of the clarinet test pieces written there in the late nineteenth century. Either because of the repertoire or because of her own disposition, some of these recordings do sound somewhat neutral interpretatively though she�s more engaging in La Bohème even if she�s really too light and superficial for Madame Butterfly. There�s an interesting pendant. After the Rode and the coloratura exploits we finish with Roussel�s Jazz dans la nuit. Is this going to be crepuscular and eerie? No, it�s actually a jaunty, cocksure vamp, with heavy bass accents and teasing rubato. Roussel�s the pianist. It�s a shame that her Come scoglio is absent because her Così was famous and might have rounded out her musical personality rather more. Similarly a fine Rossini was on Polydor 78s and is not here. Still, the copies are very acceptable; there may have been relatively minimal intervention and the copies do have the usual array of surface noise but nothing traumatic. Notes are in the current Malibran house style � minimal � and they could be expanded with profit. 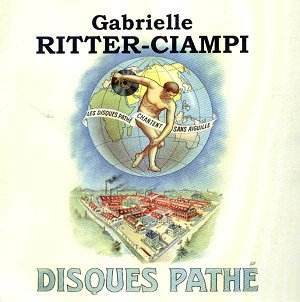 Otherwise, this is a more than welcome tribute to Ritter-Ciampi, and is part of a similarly fine collection of similar retrievals from this company.